[This] process is very clear and logical. It made me really take a hard look at where my organization puts its resources as well as what threats we ignore because of their complexity. For people responsible for the implementation of programs, this [evaluation planning] should happen from the grant process all the way through…It’s essential, it’s so critical…. It’s almost like the sugar in the cake. EMI is a leader in coordinating and facilitating evaluation and adaptive management workshops for natural resource practitioners across North America. Our half-day and day-long trainings introduce practitioners to the nuts and bolts of evaluation and adaptive management and afford them an opportunity to practice preparing an evaluation plan for their own organization using EMI’s planning process and tools. EMI trainings have reached numerous practitioners from the private, public, and non-profit sectors who work in different regions, on different problems, and in different ecosystems. We have also organized and facilitated day-long trainings for compilations of groups, including the grantees of philanthropic organizations. Our collective experience in research, training and facilitation has provided us with important insights into the challenges and benefits of site-based, outcome-oriented evaluation; insights that make us uniquely positioned to build the existing capacity of organizations to engage in ecosystem-based evaluation and adaptive management. We invite you to contact us to learn more about how we might tailor an evaluation or adaptive management training workshop for your needs. Below you will find summaries of representative training workshops as well as comments we have received from participants in these workshops. What are some examples of past trainings? EMI trainers have facilitated planning workshops in diverse settings including: Montana, Washington, Oregon, Nevada, North Carolina, Maryland, and Michigan. 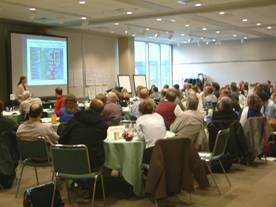 Click here to view a summary of past training workshops. What are people saying about our trainings? Many practitioners have remarked on the benefits they received from participating in an EMI evaluation training workshop. Click here for comments and pictures from representative workshops.